Myopia, or nearsightedness, is more than having to wear glasses to see things clearly far away. It is a lifestyle disease that has increased in prevalence by 60 percent in the U.S. over the past 40 years and is projected to affect one half of the world’s population by 2050. This epidemic has far-reaching consequences, as myopia, particularly higher levels, is associated with a range of serious eye diseases later in life. Environmental and genetic factors both play a role. Having two nearsighted parents increases risk six times versus if neither is, and more highly myopic parents are likely to have more highly myopic children. Long periods of time spent indoors has a big impact, too. The huge increase in electronic device use is closely associated with an ever-larger nearsighted population. There is hope, however. Fascinating recent research suggests that the more time young children spend outdoors before they become nearsighted, the more the condition can be delayed. Once nearsightedness begins, the evidence is less clear that outside time can slow things down, but it’s still beneficial in many other ways. Numerous studies over the past decade have confirmed and clarified three methods to reduce myopia progression in children. Each year brings better understanding and suggestions of even newer approaches. Two treatments are optical, and the third is pharmaceutical. Each one demonstrates 40 percent or greater slowing of myopia. Atropine drops were first used for this purpose more than 100 years ago. However, the side effects of increased light sensitivity and decreased near focusing make this a less than popular choice. New evidence indicates drastically lower amounts may be comparably effective with insignificant side effects, leading to a surge of current interest. One drop in each eye at bedtime also makes this a simple treatment to follow. The way light focuses in the periphery of the back of the eye is believed to influence signals for the eye to grow and become more myopic or not. Glasses and traditional contact lenses focus light in a way that results in a “grow” signal. Specially designed soft lenses alter this and have been shown effective in slowing myopia. Another technique with significant clinical and experimental support, called orthokeratology, or Ortho-K, uses rigid molds (similar to lenses) to achieve this. Sleeping with the molds overnight changes the front shape through the next day. This allows clear daytime vision without glasses or contact lenses, making it an excellent choice for young, active children. Ortho-K is effective and convenient for adults, but its ability to put the brakes on childhood myopia is what really makes it shine in my mind! It’s exciting news! Myopia can be controlled! Another interesting development in Myopia Control- A specially designed lens developed by The Hong Kong Polytechnic University (PolyU) has slowed down myopia progress by 60% in participating children, and 21.5% of them had their myopic progression halted completely. 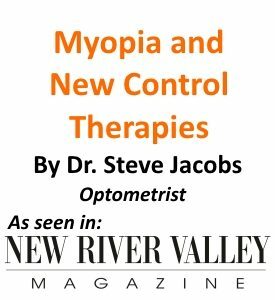 Read the latest on Myopia Control here. Following recommendations from many friends, we came to Drs. Jacobs and Diaz looking for an Ortho-K treatment for my son's myopia. It's been a fantastic experience that we never regret! Their corneal topographer took very accurate measurements of the eyes, allowing a perfect fit-in of the Ortho-K lens in just one round. Their staff gave my kid a very patient lesson and made sure he could put on and take off the lens all by himself. The care of the lens has never been hard with the kiddo managing the most difficult part. Both Dr. Jacobs and Dr. Diaz always follow up each appointment with an email, making you feel that you can ask them any questions at any time. We definitely recommend them to anyone who is looking for a similar eye treatment!